A refreshing gin punch is a great addition to any holiday party and this cranberry fresh punch is a fantastic recipe that all your guests will enjoy. It's simple and you can make it in a few hours before the party, so serving it is easy as well. The cranberry fresh punch was inspired by a Brockmans Gin recipe called the berry fresh cocktail. The combination of gin and fruits with a hint of allspice dram is fantastic for winter. While you can use another gin, you'll find that Brockmans is one of the best options for berry-flavored gin drinks. That's because its formula incorporates berries and backs off gin's signature juniper flavor. The punch recipe creates approximately about 15 4-ounce servings, so it's the perfect size for an intimate holiday party. Add a handful of ice and stir well. Refrigerate until it's time to serve. 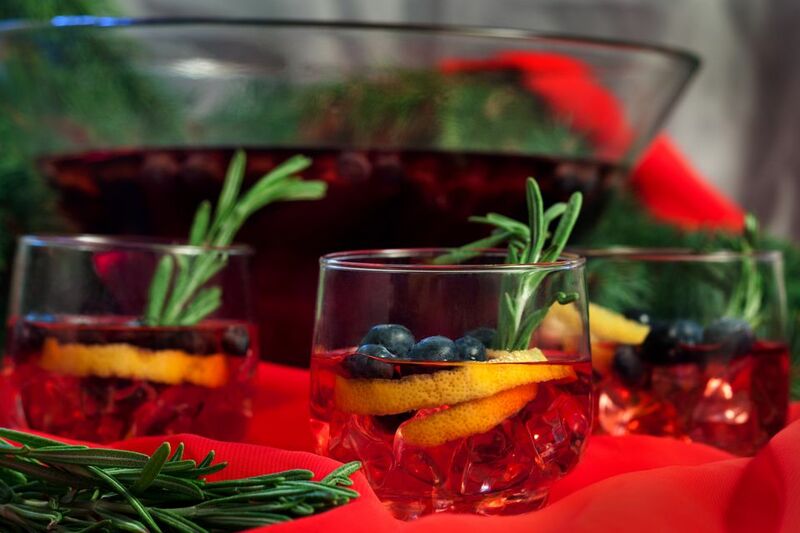 Right before the party, add an ice ring or large cubes of ice to your punch bowl. Fill it with the pre-mixed punch and add seasonal berries. To serve, add a sprig of rosemary to each glass, fill it with fresh ice, then add a ladle full of punch. Be sure to include a few berries as well. If you're using fresh-squeezed lemon juice—which is recommended—you will need about four lemons for this punch. Depending on the size, each lemon should yield around 1 3/4 ounces of juice. Before juicing, you can also cut lemon spirals from the peel and store them in ice-cold water in the refrigerator until it's time for the party. Add these when garnishing each drink. While this is a great drink to enjoy at a party, you can also enjoy it as a single-serve cocktail. It is just as easy and goes back to Brockmans' original berry fresh recipe. To make the drink, combine 2 ounces Brockmans gin, 1 ounce each triple sec and cranberry juice, 3/4 ounce lemon juice, and a bar spoon of allspice dram in a cocktail shaker. Add ice and shake well. Strain into an old-fashioned glass filled with alternating layers of crushed ice and seasonal berries. How Strong Is the Cranberry Fresh Punch? The punch recipe has been adapted from the original cocktail to make it more suitable for a party situation. The gin was cut back and cranberry took its place to ensure it doesn't take your guests by surprise. Why is that necessary? Brockmans' berry fresh recipe has an estimated alcohol content of 23 percent ABV (46 proof). By adjusting the punch, we've knocked that down to 18 percent ABV (36 proof). While the stronger drink is nice to enjoy on its own, it can be too much for unsuspecting party guests who may have more than one cup. The great news is that all the flavors are still there and it retains a nice balance. Try to keep alcohol content in mind whenever you convert a cocktail into a punch and make adjustments as you see fit. It's one small step you can do as a responsible host.